The Clean Water Act (CWA) is the cornerstone of surface water quality protection in the United States. The act does not deal directly with ground water or with water quantity issues. Some states have chosen to develop ground water quality standards (mentioned in slide 6) or water quality standards that address streamflow specifically. The statute employs various regulatory and non-regulatory tools to sharply reduce direct pollutant discharges into waterways, establish ambient water quality standards, finance municipal wastewater treatment facilities, and manage polluted runoff. These tools are employed to achieve the broader goal of restoring and maintaining the chemical, physical, and biological integrity of the nation’s waters so that they can support “the protection and propagation of fish, shellfish, and wildlife and recreation in and on the water.” The basis of the CWA was enacted in 1948 and was called the Federal Water Pollution Control Act, but the act was significantly reorganized and expanded in 1972. 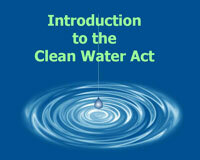 "Clean Water Act" became the act's common name with amendments in 1977. The CWA made it unlawful to discharge any pollutant from a point source into navigable waters, unless a permit authorized under the CWA was obtained. EPA's National Pollutant Discharge Elimination System (NPDES) permit program controls these “point source” discharges. Point sources are discrete conveyances, such as pipes or man-made ditches, that discharge into surface waters. Individual homes that are connected to a municipal system, use a subsurface discharging septic system, or do not have a surface discharge do not need an NPDES permit. Nevertheless, industrial, municipal, and other facilities must obtain permits if their discharges go directly to surface waters. For many years, following the passage of the CWA in 1972, EPA, states, and Indian tribes focused mainly on the chemical aspects of the water quality “integrity” goal. During the last decade, however, more attention has been given to physical and biological integrity. Also, in the early decades of the act’s implementation, efforts were focused on regulating discharges from traditional point source facilities, such as municipal sewage treatment plants and industrial wastewater facilities, with little attention paid to runoff from streets, construction sites, farms, and other “wet-weather” sources. Starting in the late 1980s, efforts to address polluted runoff have increased significantly. For “nonpoint” pollutant runoff, education and voluntary programs, including cost-sharing with landowners, are the key tool. For “wet weather point sources” like urban storm sewer systems and construction sites, a regulatory approach under the NPDES permit program is being employed. CWA programs, as they evolved over the last decade, have shifted from a program-by-program, source-by-source, pollutant-by-pollutant approach to more holistic watershed-based strategies. Under a watershed approach, equal emphasis is placed on protecting healthy waters and restoring impaired ones. A full array of issues are addressed, not just those subject to CWA regulatory authority (e.g., stream channel erosion). Involving stakeholder groups with developing and implementing strategies for achieving and maintaining state water quality standards and other environmental goals is another hallmark of this approach. How much do you know about the Clean Water Act already? To find out, take the Fact or Fiction quiz. Note: This is one of the 15 required modules in the Watershed Management Certificate Program.